On Sunday 14 June Andrew Marr interviewed Sir Christopher Kelly, Chair, The Committee On Standards In Public Life. Please note 'The Andrew Marr Show' must be credited if any part of this transcript is used. The Standards watchdog Sir Christopher Kelly says he was "shocked" by the details of MPs' expenses claims. It's been described as "parliament's darkest hour in modern times", and certainly the exposure of their expenses and allowances to public gaze has traumatised and shamed MPs of all parties - individually and as a tribe. Light bulbs to Jaffa cakes, Jacuzzis to duck houses, it seems there was no limit to what some were prepared to claim. 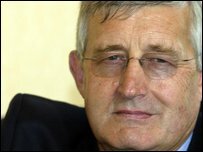 Well the man charged with devising a new system of the future, which will command the public's trust, is the Chairman of the Committee on Standards in Public Life, Sir Christopher Kelly, and he joins me now from our studio in Aberystwyth. Welcome, Sir Christopher. First of all, can I ask if you have a clearer sense now of when you will finally report? Yes. We can't be exact because we don't know what the sessions of oral evidence that we're about to begin will turn up, but I'm conscious of the great desire that so many people have for us to get this over with quickly so we can put this dreadful episode behind us. And we're now trying to produce our report by the autumn. A key date is clearly soon after parliament comes back from their summer recess in October. And when you took this job from Gordon Brown, did you have the slightest idea of what you were getting into because of course it was before this great torrent of extraordinary stories coming from the Daily Telegraph? The committee has been concerned about the system of reimbursing MPs with expenses of doing their job for some time. So we have had our eye on it for some time and the truth is that actually we proposed doing the study to Gordon Brown before he proposed it back to us. But the answer to your question is no. Until we had the revelations from the Daily Telegraph, I don't think the committee had any idea of the depth of what was happening. Were you personally surprised, amazed, what? I was both surprised and, I think it's fair to say, shocked. are you going to be able to do things like, for instance, ban payments for mortgages for second homes? We can't do anything. All we can do is make recommendations. Although we're in a very strong position because all three political parties have said that they'll accept our recommendations when we make them. But ultimately it's for parliament to decide what to, what to do. But, yes, we can make recommendations about mortgage interest. We can make recommendations about, about anything which we think is relevant to the upholding of standards in public life. How we see our role is basically to clean up the expenses system; to do so in a way which helps begin what I'm sure will be a long and difficult process of restoring trust in public office holders and to make it possible for politicians of all kinds to stop focusing their anxiety on this and actually get on with the business of running the country. You've seen agreement across the parties on some interim changes - husband and wife claims for the same house and that kind of thing, the John Lewis list being abolished and so on. Do those go far enough or are you looking at something considerably more radical? Well I think that the steps that have been taken are in the right, in the right direction. And indeed one of the comforting things about the current dreadful situation is the extent to which consensus about the principles of what needs to be done is already pretty firmly, pretty firmly established. But there is an awful lot of detail to be sorted through. independently to suggest something else should be done. And potentially to go further than the parties have gone so far? And potentially, of course, to go further. One thing I noticed that Gordon Brown highlighted in his letter to you was the question of whether or not MPs should be allowed to earn any money outside parliament. Is that something you're going to be looking at? a parliament that was composed entirely of professional politicians. If you do that, you lose quite a lot of experience and diversity. Whether a complete ban on MPs having any outside interests would affect that is something to weigh on one side of the balance. On the other side, I think most people would think that performing the role of an MP was or ought to be a pretty full-time job, and people I think would want to know if their Member of Parliament was spending a substantial amount of time doing something else other than scrutinising the executive or looking after their, looking after their interests. But it sounds as if there's no question of actually banning MPs from taking outside jobs of any kind? I don't want to pre-empt any conclusions that we might come to. The arguments have been put to us. What we're going to do now in the sessions that begin next week - the public sessions of evidence taking - is to probe some of those arguments. How confident are you that at the end of this - you'll take your evidence starting from next week and then report in October - that at the end of this, you will produce a system that is tough but also fair on the people who are MPs and that the public entirely understands? which need, which need to be sorted through. You have power and authority just now because of the political crisis, because the system has had to hand it to you. But the caravan rolls on and we're still in the end going to be in a system where MPs ultimately control themselves because of the principle of the sovereignty of parliament. Is there any way of entrenching now some kind of oversight that can stick for a long period into the future? That is, as you rightly imply, the absolutely key question, and the answer is parliament because of its sovereignty can undo anything which it's done in the past because of the absence of a written constitution. I think there may well be ways, however, to make it more difficult to do that through primary legislation and whatever. At the moment changes to the system of allowances or pay can be done by simple, by simple resolution, so there may be some technical things we can do to entrench. But ultimately, ultimately we depend on the ability of people like you and the electorate to scrutinise the way in which MPs behave, which is why I think transparency of this whole arrangement is an absolutely critical part of what needs to be done. Sir Christopher, a man with a big job, thank you very much indeed and good luck. Please note "The Andrew Marr Show" must be credited if any part of this transcript is used. NB: This transcript was typed from a recording and not copied from an original script.